Kills the weeds, not the lawn. Do not apply this product in a way that will contact any person or pet, either directly or through drift. Keep people and pets out of the area during application. Do not allow people or pets to enter the treated area until sprays have dried. Do not allow spray to drift onto desirable plants since injury may result. Do not apply as a ﬁne mist because of potential for injury to desirable plants. Do not apply when windy. Do not treat when air temperatures exceed 90°F as damage to grass may occur. Application at rates above speciﬁed on this label may cause injury to turfgrass. Do not use on ﬂoratam or bitterblue varieties of St. Augustinegrass. Do not use on carpetgrass, dichondra, lawns with desirable clovers or legumes, vegetables, fruits or ornamentals. Do not spray exposed roots of ornamentals and trees. Do not apply more than two applications per year. You must wait at least two weeks between applications. Not for use on turf being grown for sale or other commercial use such as sod, or for seed production, or for research purposes. ***Do not use on ﬂoratam or bitterblue varieties of St. Augustinegrass. Do not use this product on carpetgrass, dichondra, legumes or lawns containing desirable clovers. Fall: Spray when broadleaf weeds are young and actively growing with adequate soil moisture for best results. Fall applications will control weeds that may otherwise go dormant through the winter and resprout the following spring. ‡Visual symptoms and time to complete kill will depend on weed type, temperature and application rate. Spring: Apply when dandelion, plantain, buttercup, speedwell, knotweed and other listed broadleaf weeds are young and actively growing with adequate soil moisture for best results. The maximum application rate is 4 ﬂ oz of product per 1,000 sq ft per application (0.74 lb 2,4-D acid equivalent per acre per application). 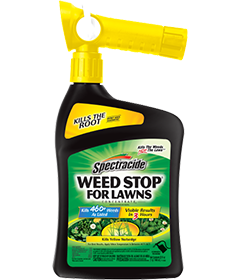 Spray until wet to control weeds. Walk at a steady pace, working back toward the faucet while spraying using an even sweeping motion, slightly overlapping treated areas. One quart will treat up to 21,333 sq ft of St. Augustinegrass, 16,000 sq ft of other warm season grasses and 8,000 sq ft of cool season grasses. Calculate square feet by multiplying length by width. Refer to sight gauge to guide coverage (example: when bottle is half empty, you should have covered half the area). Place in a cool area away from heat, sunlight or open ﬂame.